Finally, we received much-needed snow. The chart below shows the storm totals at Mores Creek Summit Snotel from last Sunday's storm. Take notice of the temperatures after the storm. Temperatures plunged into the negative teens. The good news is that snow coverage is rather uniform, even when comparing South to North aspects. Above 7000 feet the snow height is between 50 to 60 cm. The not-so-good news is that that the lower 1000 feet of elevation of Pilot Peak there are between 20-25 cm of snow, pretty much the latest storm snow. There was surface evidence of wind affected snow, but no wind loading at Pilot Peak backcountry skiing domain. The wind erosion marks in the snow suggested abnormal winds from the East to North East. The effect of the wind, and perhaps the storm rising temperatures by the end of the precipitation event resulted in mild inverted conditions. The skiing was still good, but boards with rocker will keep that tip floating and you will have a bigger smile when dealing with pockets of inverted snow conditions. So ... forget about the rock skis and bring your good boards. The morning started rather chilly, in the negative teens, and it warmed very little during the day. The snow surface temps were cold. I usually suggest using high-quality infrared thermometers - there are a lot of crappy ones out there! 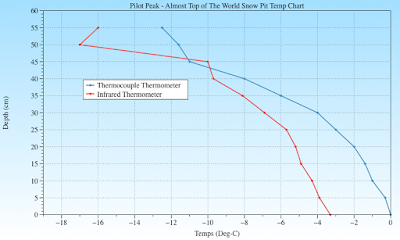 IR Thermometers are compact and enable fast measurement of very relevant snow surface temperatures. It is also possible to make good snow surface measurements with a high response (low thermal mass) thermocouple thermometer and by using good technique. To avoid averaging temperature readings with air temperature care must be taken to cover the full probe under the snow surface top. Thermocouple Thermometer measuring snow surface temps @ -18 Deg C.
Infrared Thermometer measuring snow surface temps @ -19 Deg C.
With these cold surface temperatures the new storm snow will metamorphose into facets in a few days, and the soft slab conditions will perhaps decrease during the next 48 hours, further improving the riding conditions. The skiing was surprisingly good even with the relatively shallow cover (half a meter), mild inverted snow surface conditions, and unconsolidated snowpack. Although the danger of impacting buried rocks and treefall is very real, with careful observation and ski line selection it is possible to avoid damage to your boards and yourself. Uphill track setting was uneventful, as long as you keep a healthy distance from trees, where the coverage was thinner, and rocks were close to the surface. We were surprised about the fire landscape. It looks like the fire did not burn too hot and it had a patchy nature. Most definitely it opened NEW tree lines that have not been skied before. Anyhow, it will take few more trips to fully assess the impact of the fire to Pilot's Peak Summit Creek drainage. And be ready to clean ash off your precious coats, dry snow works really good. Keeping track of the snowpack is key early in the winter. Shallow snowpack and cold December conditions enhance the formation of basal weak layers. Colder permeable dry snow storms and cold conditions also favor the rapid formation of surface weak layers. Once these weak layers, basal or surface facets are loaded by more snow, a slab develops above the weak layers resulting in persistent slab avalanche conditions. The persistent term refers to the case, where an avalanche instability lasts for a considerable amount of time. The picture below shows today's snowpack with a depth of 57 cm. The picture also shows the fracture plane at 30 cm, 27 cms below the snow surface. There was a weak layer composed of 2-3 mm stellar precipitation crystals. We observed multiple soft slab easy sudden planar compression failures (CTEQ1-SP) as well as a whole block propagation failures. 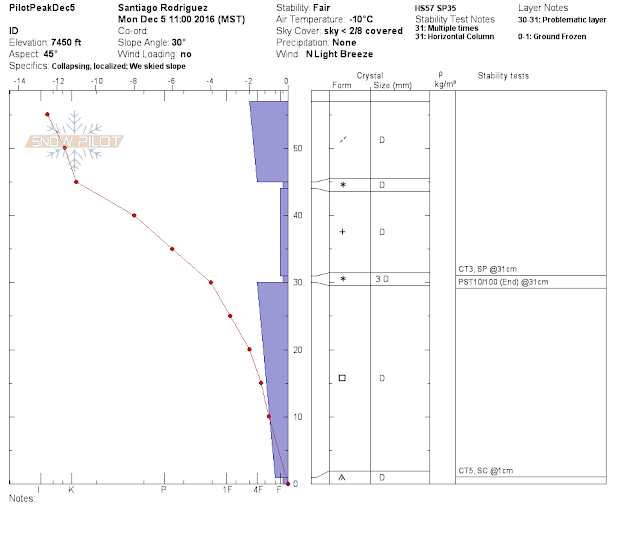 During compression testing, a single easy sudden collapse failure (CTEQ1-SC) was observed at a depth of 57 cm. These tests, as well as the snowpack development history, indicates that we should exercise caution in steep terrain. The snowpack is shallow and it is faceting fast. Indeed it is losing its slab properties. But once it gets loaded by new snow, the basal weak layer might become active. We just need loading event (snow precipitation) and a cohesive structure (wind or warms temps) to support fracture propagation on the EXISTING weak layers. Under more temperate conditions (temps closer to 0 Deg C) the weak layer buried 25 cms below the snow surface will metamorphose within 48 hours due to rounding and sintering. However, the present cold temperatures are going to slow down rounding/sintering metamorphism. 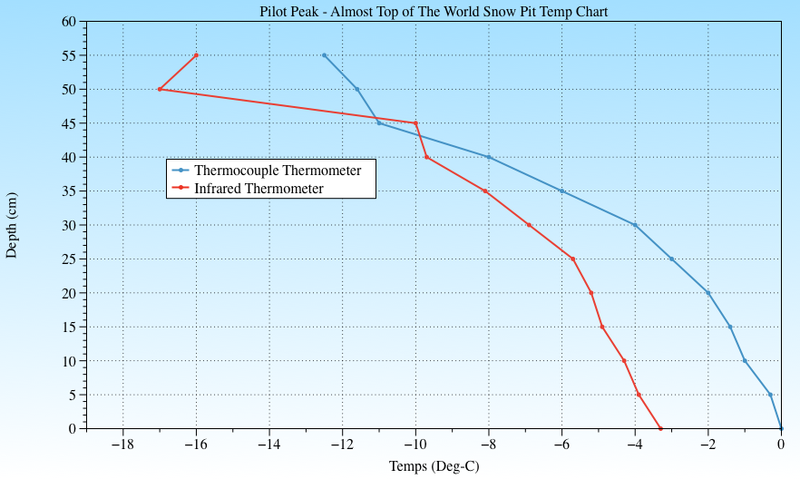 Below a chart with the temperature profile of today's snowpit. The differences between IR and TC sensors are a subject of research I am doing and it has to do with IR emissivity of various crystals structures as well as differences between bulk and surface temperature measurement. More on that subject in a future posting. Take a look at the temperatures at the 30 cm layer; -7 Deg C for IR thermometer and -4 Deg C for thermocouple thermometer. These temperatures contrast dramatically with the very cold surface temperatures. Also, above the 30 cm depth, the gradient augments (bigger change in temperatures per unit of depth). At depths above 30 cm, the steeper gradients will result in much higher water sublimation rates that will drive strong faceting. This facet metamorphism will improve skiing conditions and reduce the slab cohesiveness of the top layers. The snowpit chart with relevant information such as aspect, elevation, time, weather, temperature and hardness profiles, etcetera is included below. Inspection of this chart should easily portrait where the weak points - or weak layers are located below the snow surface. These profiles are easy to produce using online tools from http://snowpilot.org/. 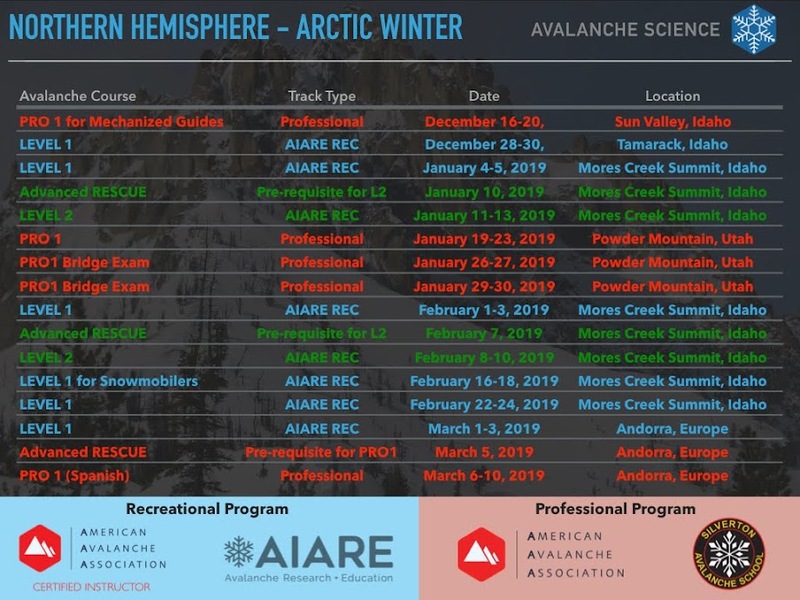 By using this non-commercial tool, you will be helping snow scientist with your snow field data. Next Thursday there is another chance for another snow precipitation event. The snow forecast is for light to moderate amounts, in the order of 10 cms. We should be vigilant, the new snow will be burying at least two reactive weak layers. This weekend, take the time to identify these two layers. Remember to make conservative decisions, it is early in the season, and we need time to dial our backcountry travel techniques and situational awareness skills. After two years abroad in Europe doing snow research, I am back to Idaho. It is good to be able again to ski through the full winter in Central Idaho mountains. I hope you enjoy the new format, colors, as well as my renewed enthusiasm to share snow conditions from our playground.